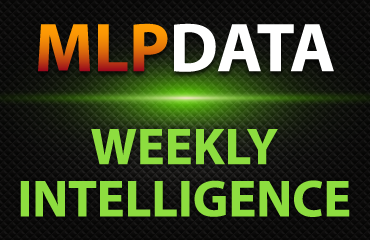 Thank you for sharing Weekly Intelligence for MLP Investors. Your email has been sent. Two MLP IPOs perform well, with both GLOP and PBFX ending the week more than 20% above the IPO unit price. With half the MLP companies reporting this week, price volatility was high as investors reacted to the results and future guidance. Niska Gas Partners abruptly changes CEOs and announces plans to expand into other midstream services. The Alerian MLP index dropped by 0.39% for the week with YTD total return at 7.38%. The S&P 500 finished the week down 0.14%. In spite of the slightly down week overall, there was plenty of earnings related good news and 30 MLP companies hit new 52-week highs. 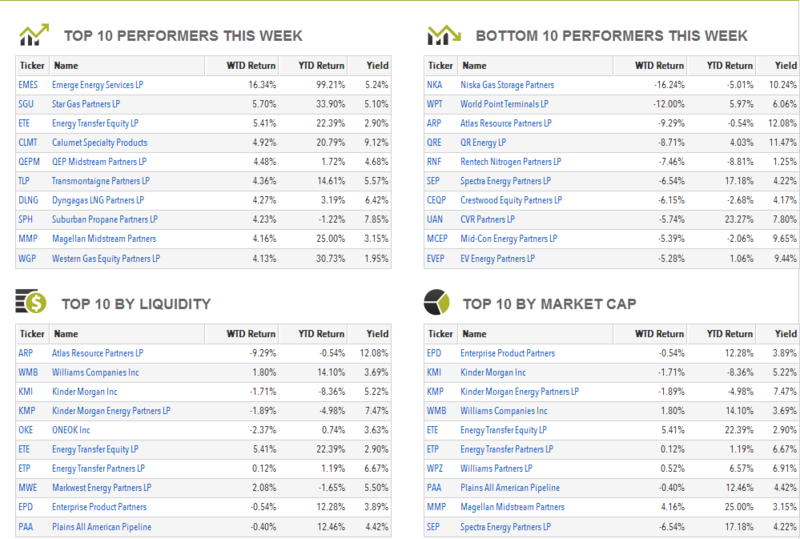 There were three 52-week lows, including solid MarkWest Energy LP (MWE), which guided to accelerating distribution growth in 2015 and 2016. However, the market continues to be concerned about volatile producer volumes. The company's Q1 earnings report only reinforced the growth prospects of Emerge Energy Services LP (EMES), with new contracts, "intense" demand for its products and permitting underway for two new facilities. The EMES unit price is up almost 100% year-to-date. Hi-Crush Partners LP (HCLP) also sells fracking sand, generated 140% TTM total return. The week's worst performer, Niska Gas Partners LP (NKA) used the earnings release to announce the CEO resignation and replacement. In addition, the recontracting of Niksa's largest gas storage company provides a one-time payment that helps ensure DCF coverage for the just started FY2015, but the lower contract rate leaves future cash flow coverage in doubt. High growth units continue to perform well, with Tallgrass Energy Partners (TEP) leading the group with a 3-year distribution growth rate in excess of 38%. John Sherman, as the former CEO of Inergy, continues to unload shares of the company that merged into NRGY. There were two well-received MLP IPOs this week: GasLog Partners LP (GLOP) and PBF Logistics LP (PBFX). 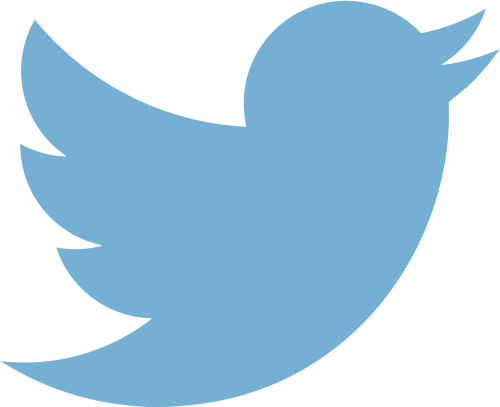 GLOP closed the week $5.62 above the $21 IPO price. PBFX closed $5.00 higher than the $23 IPO, which was at the top end of the range. Very strong institutional demand was cited by the book runner. Get the details of any offer of interest by clicking on the specific issue on the Issuance page of the MLPData Dashboard. 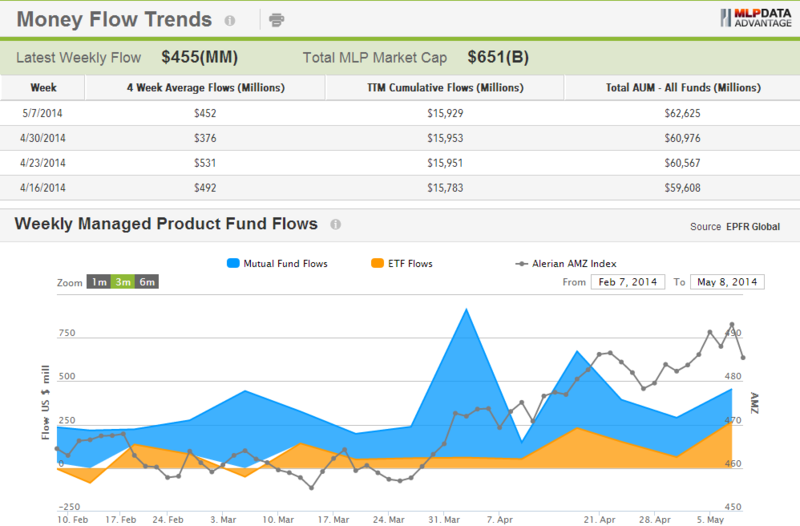 MLP focused funds added $455 million in assets for the last week, up $66 million from the previous week's inflows. Mutual funds added $187 million, down from last week. ETFs took in $267 million, over $200 million more than during the previous week. At the recent level of additions, MLP funds are adding assets at a close to 3% per month rate. As Q1 Institutional 13F's are disclosed, we will begin to see where the active funds are evolving their positions. The 2014 first quarter earnings season comes to a completion next week, with 10 more companies releasing results. Current versions of the charts published here are available on the Dashboard.